MotorUncle Forum - Which is the best SUV in 8 Lakhs to 10 Lakhs range? 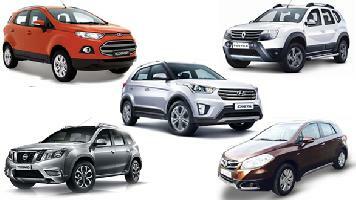 Which is the best SUV in 8 Lakhs to 10 Lakhs range? The EcoSport, Duster, Creta, Brezza, S cross have been for a while now ... Which SUV is expected to arrive soon ? Any New one ? or we still get the same old options in the Motown! ??? What about Kia , MG and Peugeot ? When are they launching their SUV ? Paul Copper Best cars under 20k with exact price and specifications. dr neelu chhabra I love the Duster ..
Anuj Guglani Nissan Kicks is coming , then You already have Tata Nexon and also facelift versions of Creta, S Cross, Eco Sport , Duster have been launched .... You also have Jeep Compass for an year now and now also the New XUV... consumers are spoilt for choices here ! What say? !